Princess Eugenie, 28, and Princess Beatrice, 29, arrived at the Serpentine Summer Party after Ascot yesterday. The pair looked very stylish at the event made famous by Princess Diana and her “revenge dress”. Princess Eugenie, daughter of Prince Andrew and Sarah Ferguson Duchess of York, both 58, posed with her fiance last night. The pair attended the annual Serpentine Summer Party. 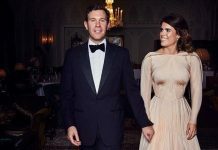 Eugenie and tequila ambassador Jack, 33, were joined by her big sister Princess Beatrice, 29. Also in attendance was their relative Lady Amelia Windsor, dubbed “the world’s most beautiful royal”. The siblings had a quick change after enjoying a day out at Royal Ascot earlier. Prince Eugenie at Royal Ascot wore a pricey £2,052 Osman dress. The white number foreshadowed her future as a bride. Her wedding to Jack is set to take place in October. The dress seemed to be inspired by a gi, the Japanese karate uniform. It had a wide belt tied in a bow. Eugenie wore the dress with a large wide brimmed hat with a tassel on it. For the Serpentine Summer Party Eugenie wore a black one shoulder dress with pink flowers on it. She added black trousers underneath and heels, with a sweep of burgundy pink lipstick. 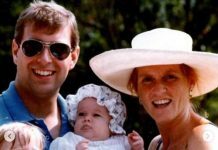 Princess Beatrice wore a dress with a peacock print. She added a leather jacket, which she wore slung over her shoulders casually, matched with a smokey eye. Meghan Markle attended Ascot yesterday with her husband Prince Harry, 33. She wore a white Givenchy dress with a large black and white Philip Treacey hat. While custom dresses can vary in prince, a Givenchy shirt dress is currently selling on website Net-a-Porter for £3,190. Taking a break from her favourite designer, Meghan wore shoes from Balenciaga. The Balenciaga Leather Knife Pumps were rendered in plain black leather. The black pair do not seem to be currently available, however a spotty pair are on sale on Net-a-Porter for £695. So how much did her look cost all together.